NEWS: The video series Mythos is now complete and available through most video outlets. This exciting fifteen-hour series includes all of the footage from Transformations of Myth Through Time plus an additional two and a half hours of previously unreleased material. We receive queries daily regarding the availability of the video series The Transformations of Myth Though Time and its relationship to the more recent series Mythos. In particular, people want to know if they can still buy the earlier series, or if we will be re-releasing Transformations. In the 1980s, Joseph Campbell presented over the course of several years a series of slide-enhanced lectures that he dubbed “The Best of Joseph Campbell.” Over thirty hours of lectures were videotaped. 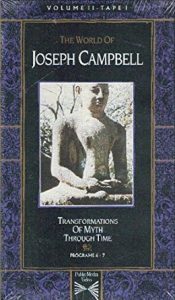 One of the individual lectures was entitled “The Transformations of Myth Through Time.” Before anything was produced from these tapes, Campbell died. The following year Joseph Campbell & the Power of Myth with Bill Moyers aired on PBS. In the wake of Campbell’s posthumous celebrity, a third party quickly and crudely edited some of the taped lectures into a thirteen-part series they entitled The Transformations of Myth Through Time and licensed the series to PBS Adult Learning Service (complete with a “Study Guide” and “Anthology of Readings”). These tapes were then briefly sold to/by Public Media Video as an eight-cassette series called The World of Joseph Campbell; to/by Highbridge Audio as a three-volume audio series (13- cassettes in 3 boxes, with a booklet of images), again entitled Transformations of Myth Through Time; and to/by HarperCollins (then, Harper & Row) as a book with the same name. Campbell’s taped lectures on James Joyce were separately released as a privately distributed 6-cassette VHS series entitled Wings of Art: Joseph Campbell on James Joyce and as a six-cassette audio series to/by Highbridge Audio. The Campbell estate went to court to protect Joseph Campbell’s copyrights. 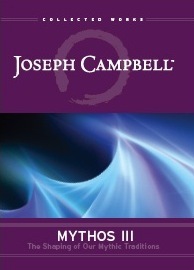 The Joseph Campbell Estate prevailed, Campbell’s rights passed to Joseph Campbell Foundation, all of the unlicensed materials (except for the book, the publication of which was governed by an open-ended agreement) were taken off the market, and Joseph Campbell Foundation began production of a comprehensive video series that reflected Joseph Campbell’s original vision. JCF began production on a four-volume (20-hour) series: Mythos. The original video footage was digitally enhanced; we obtained 1st-generation copies of the images Joseph Campbell had used as slides in his talks and permission to reproduce them in the series (we did the same with all the non-Campbell material in the tapes); and we began to edit the material into what Joseph Campbell had termed his “One Great Story.” The first two volumes (10 tapes) were released as Mythos I: The Shaping of Our Mythic Tradition and Mythos II: The Shaping of Eastern Tradition. Then, as Mythos III: The Shaping of the Western Tradition was beginning production, the licensed producer/distributor of Mythos, a company known as Unapix, filed for bankruptcy. It emerged that, prior to its bankruptcy filing, Unapix had “exclusively licensed” all of its rights in our material to another company, one formed by several former Unapix executives. 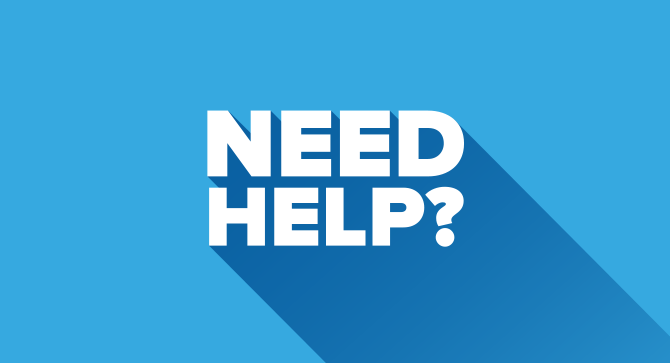 That second company subsequently also filed for bankruptcy, but once again, not before the Campbell rights were once again transferred to another new company, Wellspring, run by the same executives. Longer story shortened: for several years, we pursued our rights through various courts, finally managing to regain control of our property. The good news: we completed the Mythos series as it was originally envisioned. Mythos III, the final unreleased volume, was released on October 3, 2011. The less good news: unfortunately, we have contractual obligations—not to mention aesthetic and intellectual concerns—that preclude our re-releasing The World of Joseph Campbell or Transformations of Myth Through Time series in any format. As completed, Mythos contains all of the material in Transformations and more, and presents the information in the manner that Campbell himself did. The images that Cambell presented are clearly visible (and properly licensed from their owners), and the entire project is something of which we would like to think that Joe himself would have been proud. We are in the process of preparing the remaining lectures (on James Joyce’s novels) for a release under a separate title. (These wonderful lectures did not fit the image-centered format of the Mythos series, nor do they suit themselves to being cut into five one-hour programs, and so we have decided to release them separately.) Please keep an eye on our news blasts for updates on this upcoming release. We appreciate the patience and forebearance of our associates.